Jennifer Aniston, Drew Barrymore and Sarah Jessica Parker are apparently all converts. We're talking about the 'Celebrity Juice Diet'. But what's the truth behind the new craze? 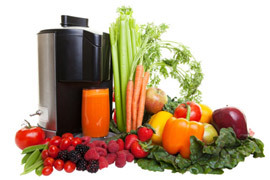 Janet, Nutracheck Nutritionist takes a look at the Juice Detox diet and shares her thoughts. 'Lose 7lbs in 7 days' is just one of a whole raft of claims linked to the Juice Diet. It's a big promise and why wouldn't someone wanting to lose weight quickly find it appealing? The Juice Detox diet claims to be a quick and simple way to lose weight and feel better by just swapping your normal diet for a range of delicious juices. Fruit and vegetable juices that are rich in vitamins, minerals and antioxidants 'cleanse' the body and get rid of toxins leaving you feeling full of energy, healthier and with clear skin. What's not to like? There is no doubt that the Juice Diet has captured everyone's interest - it was on the best sellers list in 2013 (only coming 2nd to the 5:2 diet). The problem is that if you only eat fruits and vegetables, whilst you may be getting loads of vitamins and minerals, you'll be missing out on other essential nutrients including protein, fat, complex carbohydrates, as well as micronutrients such as calcium. Is there any evidence that juicing works? In simple terms - no. There is no scientific data to show any long terms benefits of juicing. Our bodies are natural 'detox' machines - there is no need to perform a deep clean of the body in order for it to function normally. Of course making healthier choices with your diet, being physically active, not smoking and drinking plenty of water are essential to keep your body as healthy as possible, but we don't need to exclusively drink juice to get the same effect. Detox diets have been branded as a 'marketing myth' by leading dietitians and scientists and looking at the plethora of detox plans, and books out there I think I might agree! Nutracheck's position is that a weight loss programme must be supported by medically recognised evidence. Weight loss shouldn't be something that is a quick fix - it should be a lifelong change in attitude and habits, resulting in a healthier person forever. The lack of evidence for the juice diet means that it's not something that we can support, however we will of course be keeping an eye on emerging science in case anything changes on this front. Certainly a few days of juicing may well result in pounds dropped on the scales but it's very likely that going back on a 'normal' diet will mean it piling back on again. Sticking with juicing is also tricky from a social point of view - remember the NC philosophy that food is to be enjoyed, and eating shouldn't be a sin! What if I still want to try it? If you do try juicing then there's no harm in including it as part of an overall healthy and balanced diet. Some people find having a juice packed full of fruits and vegetables (with some oils, seeds or nuts in perhaps) can be a healthy start to the day. However, substituting all your food with juice is quite a drastic move, and I would recommend only doing it for a maximum of a few days. Following a period of juicing make sure you introduce food gradually, and don't overdo it straight away. You may find it takes a few days to get back to normal eating habits. Only consuming juice will mean that you have a very low calorie intake, and may feel very hungry. Your digestive system is used to having solid food, so juice may not provide the satisfaction that you get from a normal meal. Juices based on fruit will be high in sugar so you may experience sugar highs and lows on the diet. Try and use mainly vegetables in your juice to help balance things out a little. A lack of solid food may play havoc with your insides too so expect some changes in bowel movements. Exercising may also be an issue if you are only drinking juice. If you are someone who exercises a lot, this may not be right for you. The very low calorie intake that you'll get from just drinking juice is not enough to maintain you through a gym session or exercise class, so just be careful about what activities you choose. The Juice Detox Diet is another celebrity led diet craze that will result in rapid weight loss, but there is no scientific evidence whatsoever to support it as a long term weight loss tool. A combination of the juice diet and the 5:2 diet is now being sold as the next celebrity craze - eat normally for 5 days of the week, and drink only green juice for 2.